For the first time in United States history, an online casino is offering legal, regulated, live dealer roulette. Players located within the borders of New Jersey are permitted to play this unique casino game online at GoldenNuggetCasino.com. Live dealer roulette is as close to live roulette as you can get without actually going to a casino. This interactive form of online gambling is revolutionary; casino tech company Ezugi helps Golden Nugget to bring the casino wherever you happen to be. Live dealer roulette has a fascinating interface – a real, human dealer stands by a physical roulette wheel. The dealer waits for players’ bets to be placed on a virtual board. To place a bet, all players have to do is determine the amount they wish to bet and slide the virtual bet to where that want it on the board. There is a timer during each round that keeps track of how much time you have to confirm your bet. The live dealer will inform you when no more changes to your bet can be made. Once bets have been placed, the wheel is spun, the ball lands on a number, and wins and losses are calculated almost instantly. From that point, simply rinse, repeat, and enjoy the experience of playing with a human dealer from anywhere in New Jersey. What is live dealer Roulette at Golden Nugget NJ like? Currently, American Roulette is the only roulette variant available on the Golden Nugget online casino. That means the roulette wheel has 38 numbered spaces, including one zero space and one double zero space. The return to player (RTP) percentage in American roulette is the standard 94.7%. Playing live dealer roulette is an unusual experience, but the instructions given make it easy to catch on. All live dealer games are played in a similar way; simply enter the live dealer section of the online casino, wait for your dealer, then place your bets just like you would in a typical casino. 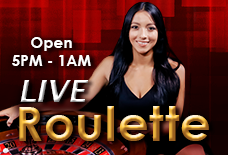 Live dealer roulette at Golden Nugget can be played on any casino software compatible device. So whether you’re on your mobile phone or at home on your tablet, live dealer roulette is accessible to you. Golden Nugget online casino offers this live dealer service between the hours of 5 pm and 1 am Eastern time. Since this is live and there are only a specific number of dealers working at a time, there is often a queue during prime hours. However, if you are looking for a truly interactive online gambling experience, it is worth the wait. What happens if something goes wrong during live dealer play? When playing with a live dealer, errors or disconnections can occur, but most major casinos will have a specific protocol to follow in such an event. For example – if a dealer accidentally breaks game procedure, the hand will pause while a shift manager comes to address the problem. Dealer error is more likely to occur during card dealing in games like Baccarat and Blackjack, but errors and disputes can even happen in Roulette. In these occurrences, an on-screen message will alert you that the issue is being looked into. If a manager determines that the error is resolvable, the hand will continue as normal. However, if an obvious solution is not obtainable, the hand will be canceled, and all bets will return to the player. The live dealers also have a system in place to handle disconnections which can happen to anyone on any internet connection. If the bets are placed before the disconnection, the hand will continue to play out as normal until you log back on. The systems in place to handle potential errors are very encouraging for any players who were skeptical of this new hybrid between online and live casino play. Players who find themselves yearning for the human interaction of a real casino when they’re playing from home should absolutely give live dealer roulette at Golden Nugget NJ a try.